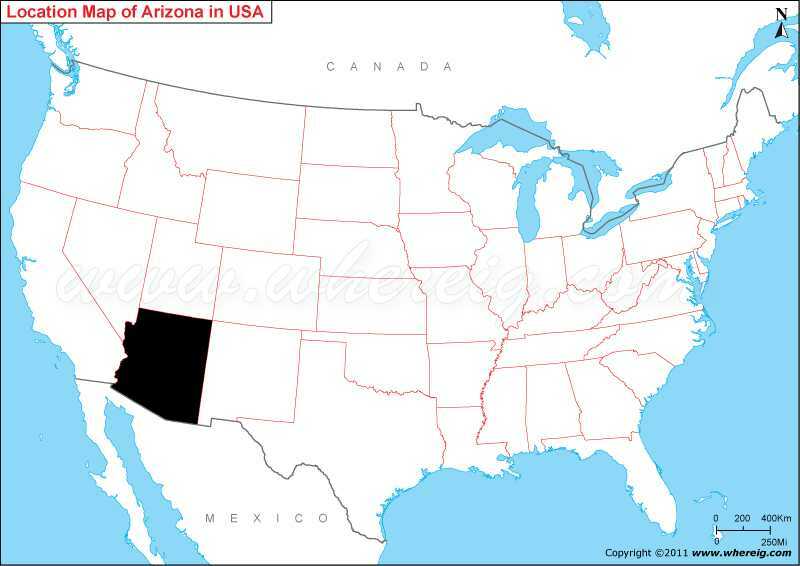 Map showing location of Arizona on the US map. Arizona is a 48th state of the United States of America constituted in 1912. As given map of Arizona shows that Arizona is located in the southwestern part of of the US; in the southern side it shares international boundary with Mexico, whereas the rest of the boundaries are shared by other states of the US; New Mexico in the east, Utah in the north, Nevada in the north west, and California in the west. The Arizona state map shown here gives the details about important cities of Arizona including the largest and capital city Phoenix along with roadways, and railways that will help you to travel across the state. Arizona has desert climate, summers are exceptionally hot, and winters are mild; however, in north of the state, it has mountain ranges where pine forests found with cooler weather. Besides, the state has one of the most tourists’ favorite spot i.e. Grand Canyon of Colorado River. Nonetheless, there are also some of the national forests, and monuments that attract tourists equally. Hence, for Arizona tour, you can take help of Arizona map.